Fans of science fiction films know all too well that outsized monsters can wreak havoc on an otherwise peaceful society. 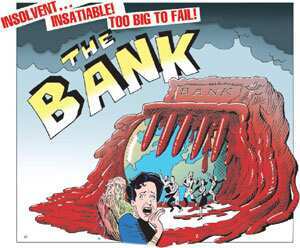 But what movie writer could have conjured up this scary scenario—too big to fail (TBTF) banks as the Blob that ate monetary policy and crippled the global economy? The very existence of these banks has blocked, or seriously undermined, the mechanisms through which monetary policy influences the economy. Economics textbooks tell us that when the US Federal Reserve encounters rising unemployment and slowing growth, it purchases short-term treasury bonds, thus lowering interest rates and inducing banks to lend more and borrowers to spend more. The banking system, and the capital markets that respond to these signals, are critical to transmitting Fed policy actions into changes in economic activity. These links normally function smoothly. Many TBTF banks grew lax about risk as they chased higher returns through complex investments. As the financial crisis erupted, these banks saw their capital bases erode and wary financial markets made them pay dearly for new capital to shore up their balance sheets. In this environment, monetary policy’s interest rate channel operated perversely. The rates that matter most for the economy’s recovery rose rather than fell. Those banks with the greatest toxic asset losses were the quickest to freeze or reduce their lending activity. Their borrowers faced higher interest rates and restricted access to funding when these banks raised their margins to ration the limited loans available or to reflect their own higher cost of funds. The credit channel also narrowed because undercapitalized banks—especially those writing off massive losses—must shrink their private sector loans. TBTF institutions account for more than half of the US banking sector, and the industry is even more highly concentrated in the European Union (EU). Small banks, most of them well capitalized, simply don’t have the capacity to offset the TBTF banks’ shrinking lending. The balance sheet channel depends on falling interest rates to push up the value of assets, creating a positive wealth effect that stimulates spending. When the financial crisis pushed interest rates perversely high, balance sheet deleveraging took place instead. Falling interest rates usually drive down the dollar’s value against other currencies, opening an exchange rate channel for monetary policy that boosts exports. In the financial crisis, the dollar rose relative to the euro and pound. This unusual behaviour partly reflected higher interest rates, but probably had more to do with the perception that conditions at TBTF banks were worse in the EU than in the US. Finally, the troubles of TBTF institutions gummed up the capital market channel. In past crises, large companies had the alternative of issuing bonds when troubled banks raised rates or curtailed lending. In the past decade, however, deregulation allowed TBTF banks to become major players in capital markets. The dead weight of their toxic assets diminished the capacity of markets to keep debt and equity capital flowing to businesses and scared investors away. Obstructions in the monetary policy channels worsened the recession. With its conventional policy tools blocked, the Fed has resorted to unprecedented measures over the past two years, opening new channels to bypass the blocked ones and restore the US economy’s credit flows. Guarding against a resurgence of the omnivorous TBTF Blob will be among the goals of financial reform. Most observers agree on the need to implement and enforce rules that require more capital and less leverage for TBTF financial institutions. We need to develop supervision and resolution mechanisms that make it possible for even the biggest boys to fail — in an orderly way, of course. We want creative destruction to work its wonders in the financial sector, just as it does elsewhere in the economy, so we never again have a system held hostage to poor risk management. Other useful ideas centre on creating early warning systems and acting more quickly to resolve problems at large financial enterprises with overwhelming problems. For example, we might require the largest institutions to issue debt with mandatory conversion to equity when certain triggers are reached. The existence of this contingency capital would induce debt holders to exert more market discipline on management and encourage increased transparency and reduced complexity, not to mention speed up the bankruptcy process. Since the Blob reduces the effectiveness of monetary policy’s transmission mechanisms, unorthodox policies become the only recourse. These measures carry great risks. Don’t do enough and the economy may descend into a deflationary spiral. Doing too much for too long may ignite an inflationary burst. Holding the TBTF Blob at bay will help keep the conventional channels operational. Monetary policy will stay in the ideal middle ground, navigating small changes in inflation, where central bankers are most comfortable and economies perform at maximum efficiency.